The Newport Collection is one of Hanamint’s enduring designs; it is simple, attractive, adaptable and budget friendly, compared. The tabletop features the iconic cross hatch design of their Newport collection. This sturdy design is finished with Hanamint’s select 8-step powder-coating, which resists fading and chipping. The Crystal Burner assembly provides 60,000 BTUs of LP or natural gas flames, filtered through a glittering layer of “crystal” glass beads. Easy to light, the Crystal burner comes with a push button igniter. 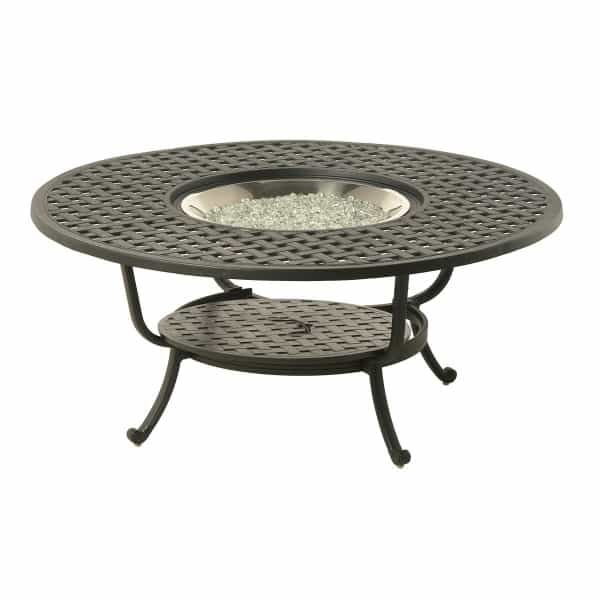 The Newport Gas Firepit Table matches perfectly with other pieces from Hanamint’s Newport collection, but the classic and versatile design may integrate seamlessly into another utdoor patio furniture setting.